In honor of the Game of Thrones premiere tonight, I thought it would be fun to get creative with our dinner as I often like to do. Plus, one of our awesome friends gifted us the official G.O.T. 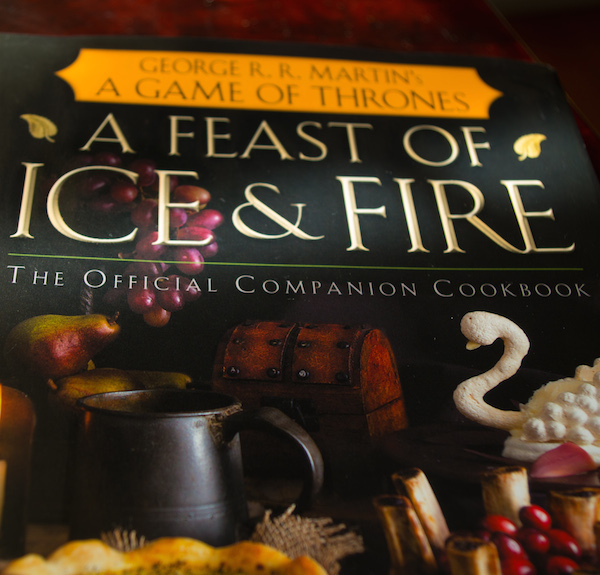 cookbook (A Feast of Ice and Fire: The Official Game of Thrones Companion Cookbook), which I will be making some yummy lamb chops from! But I felt we also needed a special dessert and decided to focus on my favorite item in the series - the moon door. For those of you that don't watch Game of Thrones the moon door is essentially a huge hole in the floor of The Eyrie (House of Arryn) where the people that piss you off get a flight to their demise aka fall to their death. I actually close my eyes through half of this show because I don't really like the barbaric crap that goes on, plus there is little redemption or lasting happiness, but it is pretty interesting nonetheless. The characters are really good and most of them detestable, so it would probably be shorter if I told you those I would not like to throw through the moon door which would be Khaleesi, the Imp, Jon Snow, Arya Stark and Sansa Stark (for now - depending on how her character develops this could change)...everyone else...see ya. In mixing bowl, beat sugar and butter for about 2 - 3 minutes, add vanilla. Combine flour, baking powder and salt in small bowl and add slowly. Mix for about one minute or until pea/marble like consistency. Separate dough into two balls and flatten into disk, cover with saran wrap and refrigerate for 1 hour to overnight. (I did overnight). When dough is ready, preheat oven to 350 degrees. Remove disks from fridge and roll out to about 1/8 inch on a floured surface. I learned from someone wiser than me to cover the top with parchment and roll out that way so you are constantly adding more flour to your bake good. Using a round pastry cutter between 2.5 - 3 inches, cut out cookies. A wide-mouth mason jar was the perfect size for me. But cut outs on lined baking sheet back in fridge for 15 minutes. Then bake for 10 - 12 minutes. In a pan, heat sugar, corn syrup, water and salt over high heat until candy thermometer reads 240 degrees. While the sugary mixture is heating, beat egg whites until peaks form. When desired temperature is reached, add 1/8 cup of hot mixture at a time to egg whites at a time and beat on high until glossy peaks form. It is important to add a little of the hot sugar mix at a time because it will scramble the eggs otherwise. 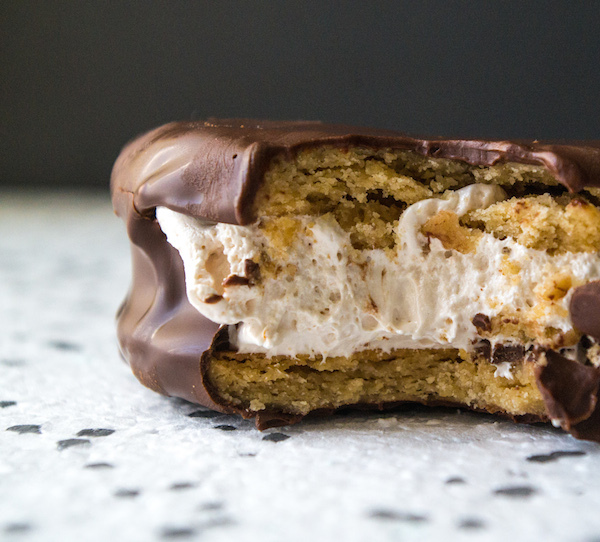 Sandwich marshmallow cream between two graham cracker cookies. Once all are complete, prepare your chocolate and dip each cookie in melted chocolate. Let cookies set-up on a cooking rack so extra chocolate can drip off, then put back in fridge to harden a bit. Add chips and oil to microwave safe bowl. Microwave for 30 seconds, stir then repeat until chocolate is fully melted.